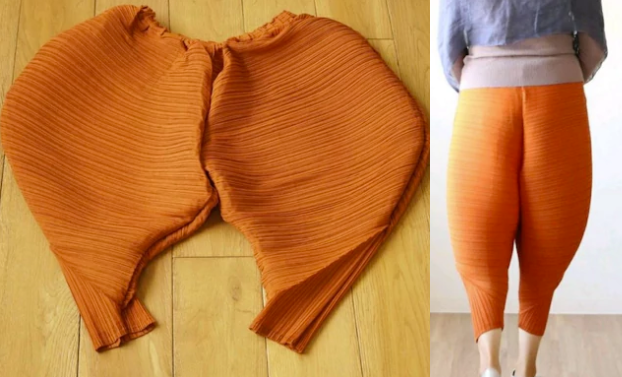 You’ve probably seen some outrageous fashion trends over the decades, but when a Twitter user came across the craziest pants (in probably forever), the reactions came to the same conclusion: these pants look delicious. The bright orange monstrosity garment has a uniquely specific look that is genuinely confusing. If you thought glitter hair, helix eyes, ear paint, and flower beards were strange, you have clearly never heard of fried chicken pants. All I can think about when I look at these pants is KFC,” he wrote. Well then. Once they are worn, they aren’t that bad? I guess? The material “poofs” in an interesting way, and maybe people would enjoy wearing them to obscure festivals, but in the end they are just confusing. On a serious note, they’re making me hungry. Would you ever wear these? Maybe if they were in any color other than orange…but these are the exact shade of “fried chicken” that would just be too much.